Since 1906, the 30-06 has been used all over America, both as a military round and as a civilian round. 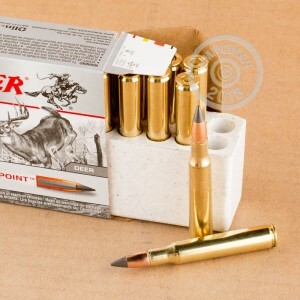 It remains one of the most popular hunting and match cartridges in America. With it's long range and high power, it is capable of taking down big game and with the right ammunition is perfect for deer hunting. 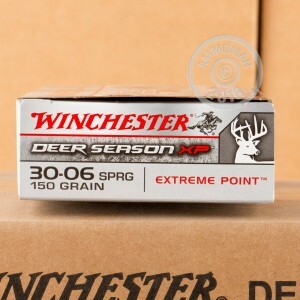 These Winchester Deer Season rounds are the right choice for your next hunting trip. Winchester specifically designed these rounds for opium expansion and penetration in thin skinned big game. 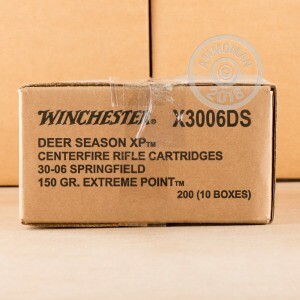 Each cartridge in this box of 20 features a factory fresh brass casing that comes boxer primed and can be re-loaded. Firing at 2920 feet per second, these 150 grain polymer tip rounds have the energy and expansion you need to bring down that next trophy.